Now is a good time to pay attention to particulars that may arise with the holidays coming up on the horizon. Seniors often prefer inviting family and friends to the community instead of breaking their routines by going out. This proved to be true when an informal poll taken in several communities in December 2016 was published in the Huffington Post, by Laura Dixon. It revealed that 50 to 80 percent of their residents chose this option. 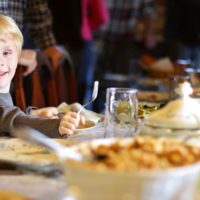 It also provides the perfect opportunity, with decorations creating a warm, cozy feeling in your facility, to allow your residents’ guests to experience your dining room superiority when they notice the positive attitude of your Kind Dining-trained servers and the personal attention paid to each resident. When these culture changes appear, your residents know that someone is listening to them. The dining room is your greatest asset! At this time of the year, when your clients are sentimental and missing their former lives. A thoughtful consideration goes a long way to soothing a sad resident. Introducing specialty holiday foods will be noticed and greatly appreciated. These small additions to the menu will fill many pockets of yearning and your residents will introduce a remembered story to tell their dining companions. This is so important, socially, in forming new friendships in the dining room. Since the dining room is the heart of the community where residents socialize during their three meals a day, it is also the ideal place to focus on kindness. It can turn around an unhappy resident who may be complaining about a food or service, when they are really suffering a change of medicine affecting him adversely or family attention she really craves. Once your servers are trained they will recognize this immediately and be able to respond with kind understanding. Add the appearance of your chef in the dining room after the main course, asking if they are savoring the meals he created especially for their holiday enjoyment and the seniors will know that he really is putting their desires first. This holiday season turn your facility into an exceptional community that speaks for itself by using Truths 1, 2, & 6 from the Six Truths. #1: Mealtime is the Best Marketing Tool for Your Community. #2: Seniors in the Community Focus on Meal Times. #6 Investing in Your Employees is Best for Culture Change. Learn more about the 6 truths in 5 minutes, by watching the video on our website. Be sure to watch for our new Table tips message on Tuesday’s beginning next month, and our Share a Kindness Today, Thursday Blog posts. Thank you for choosing Higher Standards as your training partner, and Kind Dining as your training tool.